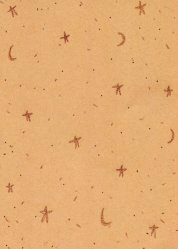 Click on a picture to see the full-sized version. 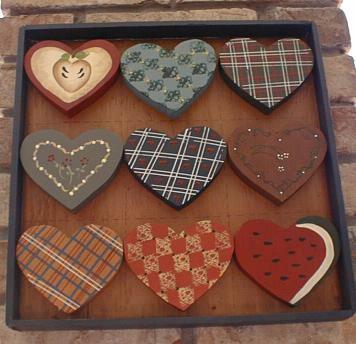 This is a country heart sampler with 9 hearts painted in rust, reds, blues, and greens. The hearts are in plaid patterns, florals and fruit designs. The sampler measures 12" by 12". It comes in three different colored borders, barn red, navy blue, and hunter green. Cost for set $24.00 plus $6.05 for shipping and insurance. 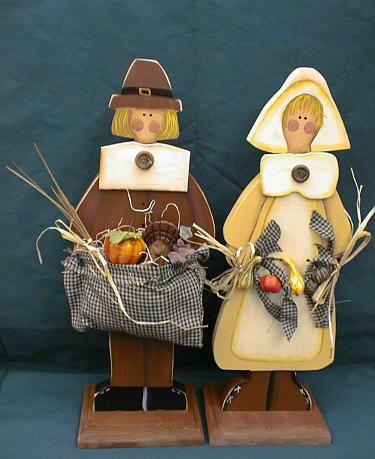 This whimsical pilgrim pair is painted in earth tones and decorated with pumpkins, gourds, and even a turkey! The pair stands approximately 17" tall. Cost for set $28.00 plus $6.05 for shipping and insurance. 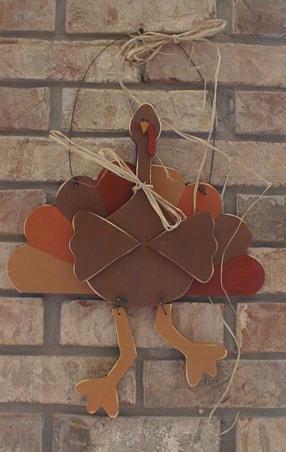 The silly turkey is great to hang on a door or around the house. He measures approximately 15" but the wire with raffia ribbon adds more height. This cute turkey is painted in dark brown, terra cotta, golden brown and rust red. Cost is $14.00 plus $4.50 for shipping and insurance. The set of 3 wooden candles is a great rustic decoration that can be used all year. Each candle is stained so that the wood grain shows through. Candles are available in Barn Red, Hunter Green, and Navy Blue. They are tied together with a natural gauze and gold ribbon. Seasonal picks can easily be added and changed behind the ribbbon to take on seasonal charm. The candles measure approximately 9", 7", & 5 1/2" tall to the top of the candle. The flame adds another 1" to 2" in height. The cost per set is $12.00 plus $4.50 for shipping and insurance.